This book is a symphony composed in two parts. The first section is entitled "Osiris, Isis and Planet X" and it looks into the possibility that there is an intimate physical connection between Planet X and the Sirius star system. Rob Solarion untangles some of the mythology regarding these two celestial subjects, and draws parallels between them. He suggests that Planet X originally came from the Sirius system, perhaps connected at some point in the past with a catastrophic event there. He then advocates a rather more tenuous possibility: that Planet X shuttles between the two star systems during its 3600 year orbital cycle. To help present his case, Rob examines the work of other authors, drawing out key material and providing substantial commentary. This is an unusual format for a book. It is almost like listening to a compilation CD; you get the opportunity to sample the ideas and writings of various researchers whilst at the same time following a general thread of the book's own. Some of these authors I am already particularly acquainted with, so I naturally tended to gloss over various tracts, but others I had not come across, like Andrew Tomas, whose work I found quite fascinating. As a general introduction to the genre of Planet X/Ancient Astronauts/Alternative Knowledge, Rob's book serves as a useful compendium. My own particular interest in Planet X research is amalgamating speculative mythological enquiry with scientific understanding, and thus my personal bias in reading any book on the subject tends to be aligned with this focus. Regrettably, the idea that a planet may shuttle between disconnected star systems is unlikely. And the distances involved are immense; certainly a 3600 year orbit is not at all appropriate for this kind of projected activity. The orbital period would need to be of an entirely different order of magnitude. But that is just one way of looking at and interpreting Rob's work. I certainly would agree with him that there may well be a connection between the Anunnaki of Sitchin's Nibiru, and the gods of the Dogon tribe, whose home appears to be the Sirius system. It is by no means a redundant endeavour to explore this connection, and Rob's book does this wonderfully well. This is particularly true of Rob's mythological analysis. His expansive knowledge of myth and comparative ancient religion is remarkable. It is also fair to say that Rob's writing style is warm and open, and his frequent inclusions of wit and philosophical musings are delightful. If he disagrees with a claim made by an author he says so, but not in such a way as to disparage the work he is reviewing. This is a welcome attitude in the alternative field, which can sometimes be more unkind, even negative in its outlook. Rob conveys real human warmth, and his mature attitude is no doubt built upon his extensive experiences of travel and adventure, his accounts of which are splendid. Which brings me to the second section of the book, entitled "Chasing the Centuries". This section is a collection of other essays (perhaps allowing Rob to tie up a few loose ends in his authorship). They are generally more orientated towards myth, and chronologies. although two simply recount field trips in Greece and New Mexico. Rob's work in the field of Velikovskian studies is well known, and most of these essays are orientated in that direction. His chronologies have been meticulously researched, and are clearly a labour of love. I will admit to struggling with Velikovsky, instead preferring more mainstream writers like the maverick British academic David Rohl. I can see the need for reviewing ancient chronologies, but I have not the wit or wish to be pulled into such a morass of arcane learning. I can only sit in my armchair and gawp at the intensity of this work, and how much is involved in its creation. Not only that, but Rob Solarion also presents a comprehensive comparison between the deities of various ancient pantheons. Remarkable work, Rob! I have come away with a heightened respect for Rob Solarion's chronological re-workings, that's for sure. 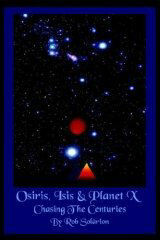 "Osiris, Isis and Planet X" is the culmination of a great deal of study, and is presented by Rob with his characteristic wit and charm. The book is worthy of study by any serious reader of Zecharia Sitchin, Robert Temple or Dr Velikovsky.